Here it is July already! Wow! For the potd I had to put myself to work. I didn't have anything to shoot today. Well, I could have gotten a few things but they've already made an appearance. So I got to work to give you something new. (Well, new for this house.) Then the pictures of the work didn't turn out. You'll have to wait for the finished project. Wondering what I'm talking about? Lulu and Gertie are getting a make over for their (laundry) room. I love the color I picked out. This is a pretty good substitute for the real thing. 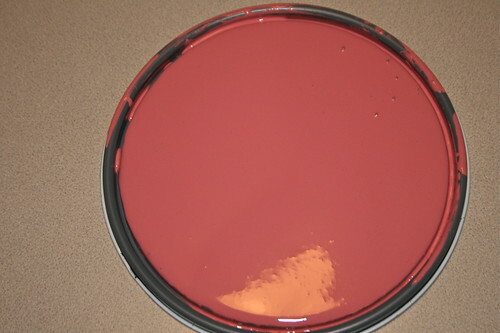 It's called Deep Bloom by Behr. I've only done two walls but it's so much better than the light tan it's covering. It feels cozy instead of sterile. The pink also looks great with the oak trim. I've been itching to paint and add some color to this house. I chose the laundry room because it is the first room we see when we come through the garage door, it doesn't have wallpaper that needs to be removed, and it's probably the smallest room in the house. With all the eyes that will see it I think the room needs to be beautiful and welcoming. I'm in there a lot doing one to two loads a day. I'm considering painting polka dots or stripes in a lighter and darker color. I'll decide once all the walls are painted. Stay tuned for a look at the finished project. Maybe next week? Can't make any promises. You are always so daring with your colors. I'll never forget blueberry yogurt!